Charles "Chuck" P. A. Melville is a furry author and artist. From 1998-2004, he also served on Conifur's staff as head of the convention’s dealers den. Over the years he has contributed to several APAs and fanzines, including Ink Spots, Q, Gallery, The Ever-Changing Palace, and Tales of the Tai-Pan Universe. He was a guest of honor at ConFurence 3 (1992), and at Conifur 2003. Chuck self-published Champion Of Katara in 1986, first becoming involved with furry fandom upon joining Rowrbrazzle in 1987. In 1991 he moved from Rochester, NY to Seattle, WA, becoming a part of MU Press, first as co-editor (and co-creator) of The Furkindred: A Shared World with Edd Vick, and then from 1993–1997 as editor of MU’s anthropomorphic books, such as Zu, Cyberkitties, Fangs of K'aath, and Corus. He also contributed short stories to some of the titles. 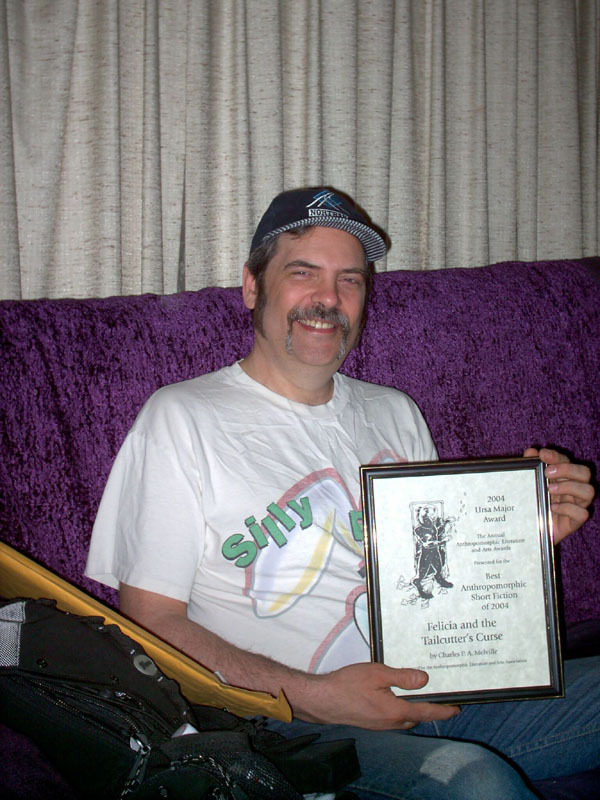 Chuck was nominated several times for an Ursa Major Award; first in 2002 for best illustration – the cover of Wild Kingdom #13 – and once in 2003 for best short story – "Riding The Lady" in Tales Of The Tai-Pan #33. In 2004, two of his self-published novelettes - "Felicia And The Dreaded Book Of Un" and "Felicia And The Tailcutter’s Curse" - were nominated for best short story; the latter won. Felicia, a supporting character from the Champion of Katara stories, was previously the protagonist of a long-running serial in Rowrbrazzle, subsequently collected in MU Press's graphic novel Felicia: Melari's Wish. "Wanting More Than Earth And Sky"
"A Day At The Wire"
no. 37: "Invasion Of The Iktome"